While re-reading the bio on Ben Benedetto I remembered something that happened to our company soon after we landed at Inchon, Korea on September 8, 1945. I left Pearl Harbor on July 3, 1945, for Eniwetok Island in the Marshalls. We then took off to an Island rest stop, Mog Mog, familiar to many GI's. I arrived on Okinawa in late July or early August. As I remember, the ship encountered a typhoon off Okinawa on July 29, 1945. 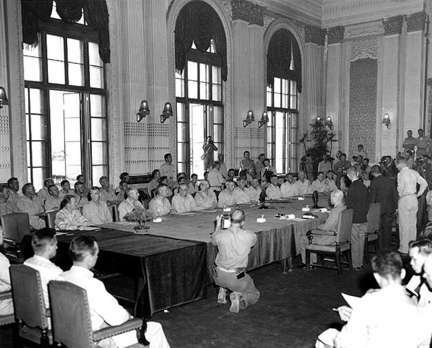 The campaign for Okinawa began on April 1, 1945. The island was declared secure on June 21st. 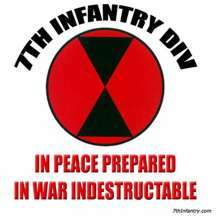 I became the squad leader as a staff sergeant.of the 10th Army, 24th Corps, 7th Infantry Division, 32nd Infantry Regiment, 2nd Battalion, Company B, Mortar section. The destroyer USS Mullany, hit by a Kamikaze pilot flying a Nakajima 43 fighter. The pilot was still in the plane when this picture was taken. This is an official US Navy photo. This occurred on April 6, 1945. 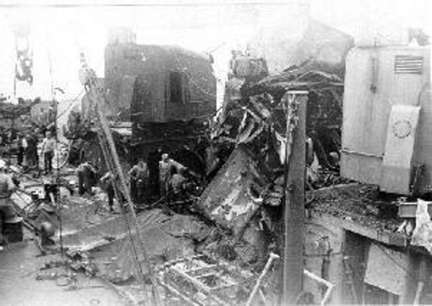 This ship was one of 25 Naval ship damaged or destroyed during the Okinawa campaign by Kamikaze planes (see below). We were very thankful for the bombs that were dropped on August 6th on Hiroshima and on August 9th, Nagasaki! that were dropped on August 6th on Hiroshima and on August 9th, Nagasaki! See Trinity, The Destoyer of Worlds. within the last few hours. Immediately upon entering the barracks, guess what we saw so recently inscribed on the walls of the barracks; you guessed it "KILROY WAS HERE," along with the usual face peering over the wall. ship, then spent about two days there. I remember seeing a warehouse almost full of Red Cross packages, which had never been given to the prisoners. My stay in Korea took me over to the east side of the country to a little town by the name of UtChin where we spent the winter of 1945-46. 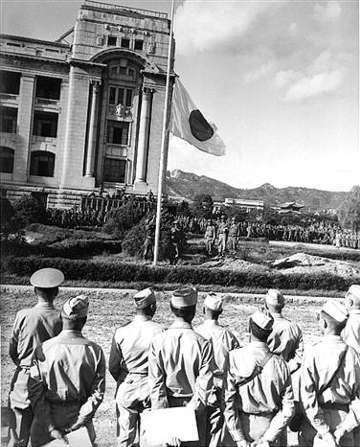 In the early spring of 1946 we moved to an isolated location north of Seoul immediately south of the 38th parallel. Here we daily monitored the passage of refugees across the parallel, mostly from north to south. 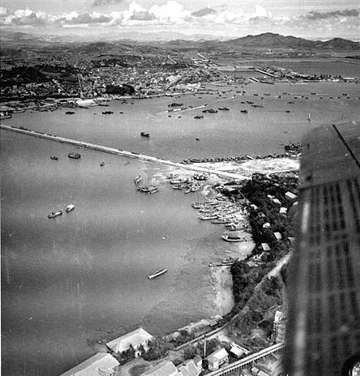 I stayed in UtChin until I left Korea on August 22, 1946. After leaving Korea on an APA (troopship) we stopped for a short time in Yokohama, Japan and then across the Pacific to Seattle Washington. From Seattle we went to Fort Sam Houston at San Antonio, Texas. The effective date of my discharge was October 30, 1946, though I actually came home before that. 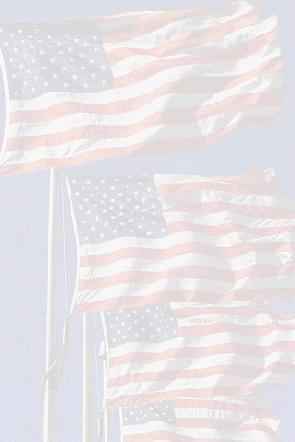 My military service lasted 1 year, 11 months, and 28 days, from November 3, 1944 to October 10, 1946. * From this picture, you can sense the effect of daily kamikaze attacks on the navy ships around Okinawa. This began April 1, 1945 through the last failed attempt August 15, 1945. The last seven planes were shot down by american fighters. My step-father was a Lt. Commander on this ship on that day. Lt. Commander Joe Moring.